It has been about five years since Funko Pops achieved pop culture phenomenon status first in the United States then across the world. Domestically, they just continue to grow in popularity. Greenhills Shopping Center used to be known to fans as comic book central back in the 1980s and 1990s. Now it has become a toy central with no less than 26 shops selling various merchandise with most of them carrying those addicting bobbleheads. We spoke with two persons, Sebastian Golez, who owns Kramer Toy Warden, and Marlo Naval, a restaurateur, about the market and their collecting habits. 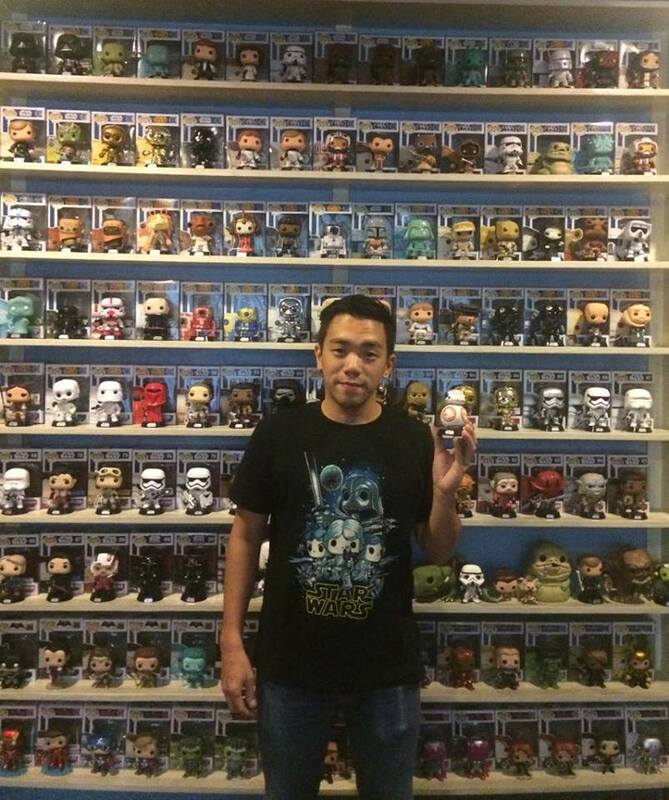 How would you describe the market for Funko Pops in the Philippines? Is it huge? Or is it a growing one? Sebastian: It's big! Not as huge as the other markets but it's certainly one of the most active according to our international counterparts. It's a diverse community consisting of people from all walks of life, different ages and from different professions and backgrounds. There's a lot going on. Plenty of interaction. We've been selling toys for around 10 years now, Pops for about five or six years. I see a lot of diversity in terms of customers. For other lines, it's usually the regular Pop culture or comic, movie buffs. The great thing with Pop! is that they have so many lines and licences. That is why they attract so many people. We have Pops! from the Breakfast Club, Sixteen Candles, Back to the Future, Ghostbusters, Karate Kid, Pulp Fiction, Scarface, Saved by the Bell, Star Wars, DC Comics, Marvel Comics, the Simpsons, the Walking Dead, Game of Thrones, X-Files. We have Manny Pacquiao, Mario Maurer, the Aswang, White Lady. Think of a popular television, movie, comic, video game... It's very likely that there's a Pop version. Can you tell us more about the demographics of the Pop buyers? I was in your store last week and I saw a couple (husband and wife with their son) buy loads of Pops. It looked like the wife was into it as well. Sebastian: I think i know about a dozen of couples like that. Some wives or partners usually just accompany their husbands or partner to the store. They used to be our number one enemy, that's why we have couches in the store (concept we got from the "man chairs" in women's boutiques), now we see them going in to the store and spending more than their partners. Pop buyers come from all walks of life. We have kids and lolos buying them as well. It's also the first time ever that we are selling something that sells as much to women as to men. In Greenhills alone, there are over 24 shops that sell Pops. How do you stay competitive? Sebastian: You have to be up to date and you have to know what the clients want. We make it a point to carry almost everything with extras for the "hot" items. These usually come from customers themselves. I try to stay as active as I can so that i can get the coming trends. I'm close to my customers and they usually give me good advice. Our staff are accustomed to the same manner as well so we usually value their input as well. Happy staff, happy customers equals good business. What are the most popular/saleable Pops at least from Kramer? Sebastian: The most popular would have to be the Star Wars, Marvel and Disney Pops. Recently, we also carried the "Friends” (Monica, Phoebe, Chandler and the gang) Pops and those sold out very quickly. Kung Fu Panda, Game of Thrones, Batman Vs. Superman Pops are doing well too. Do you collect a lot of Pops or are there particular ones you collect? Marlo: I collect different lines. Star Wars and Game of Thrones are my favorites. I make sure I complete all of them including variants and exclusives. Those two lines are my complete and treasured lines for now. The Marvel line is my second best, it's not complete but I like them a lot. Let's talk about the hunt for the Pops you want. Do you order from abroad? Do you pay a lot for them? What's the fun part of collecting and hunting down Pops? Marlo: The fun part in collecting pops is that every character that you know from your childhood, TV, movies, etc..they have it! I can't get enough of them. Hunting them down is tricky though especially if you're just new to the pop game and you like the old and rare figures. I started collecting pops four years ago when the group was still small. The prices were low and the demand was low as well. Now it's crazy! The prices are crazy and the people are getting crazier just for the love of pops! Haha. Do you haggle for lower prices? Marlo: I really don't haggle prices when it comes to pops because I think I have an idea already how much the pop is worth, if it's too expensive I won't even bother to buy the pop, just let it be. 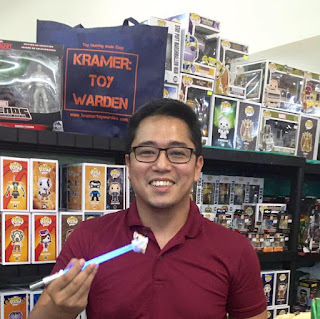 I buy pops from online stores, online sellers and retail stores here in Manila. There's a lot now than before, which is really good for us collectors. However, the game is much more competitive. What are your five most treasured Pops? 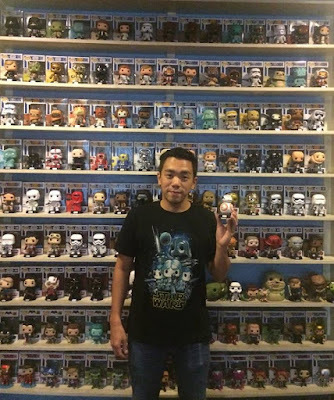 Marlo: My five most treasured pops would be my SDCC Gold Loki, SDCC Shadow Trooper, SDCC Flocked Chewbacca, V Freddy Funko, and SDCC Headless Ned Stark.